Increasing costs for fresh water and wastewater discharge coupled with diminishing availability of fresh water from natural sources have resulted in an increased emphasis on wastewater recycle/reuse for industrial applications. Aquatech incorporates their experience with the following technologies to provide the optimum system. 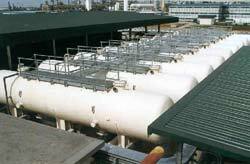 Aquatech has supplied over 38 wastewater treatment systems with the largest being 5500 gpm. Aquatech International Corp., One Four Coins Drive, Canonsburg, PA 15317. Tel: 724-746-5300; Fax: 724-746-5359.